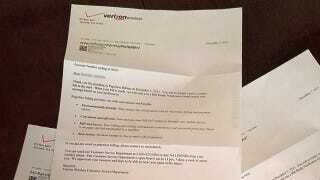 Verizon Confirms Paperless Billing by Mailing Four. Paper. Letters. When Dan Rosen tired of receiving his Verizon bill by mail, he did what any eco-aware smartphone owner would: switch to paperless billing. To celebrate Dan's choice to reduce waste, the carrier sent him a paper letter. Four of them, actually. All identical. On the same day. Where to begin! With the inefficiency? The waste? The skull-crushing irony? The fact that each letter leads off with just how environmentally friendly paperless billing is? Maybe we can just file it all under the broader category of incompetence. That seems to cover the bases. Below, Dan's full haul in all its inefficient glory. We're eagerly awaiting the followup mailer apologizing for the waste, preferably delivered by a coal engine, strapped to the back of a Northern White rhino, written in saffron ink.